Happy April Fool’s Day and be sure to be on the lookout for any business related pranks today. Also today was Working Women Wednesdays on That Business Show and thanks again to Jessica Rivelli and her amazing networking group of professional women for sponsoring and being part of Working Women Wednesdays, featured every Wednesdays on That Business Show with Jamie Meloni. Learn more about this influential group at www.workingwomenoftampabay.com. Jessica Rivelli opens the show with a discussion of the Women Entrepreneurs Exchange (WE2) which is a networking meeting on April 6th at the On Point Executive Center discussed more further down this post. This is a monthly roundtable for passionate and driven females for a close, one on one discussion about how to boost their businesses. Learn more about this at http://www.workingwomenoftampabay.com under the events tab. On the first half of the show, I spoke with Juliann Nichols, CEO and Founder of Focus on You Strategy, Juliann started her business focuses on coaching and consulting geared towards professional women on bringing out the CEO in them in 2008. Juliann is an accomplished business professional and tells her story of entrepreneurship passing through careers as a private investigator looking at workers comp fraud and also as a handbag designer prior to launching Focus on You Strategy. Through Juliann’s business, Focus on You Strategy, she provides coaching that empowers individuals and groups to unlock hidden potential and discover new ways of thinking and to clarify their goals to develop new growth strategies. She has programs that cater to individual or group sessions and typical meetings are weekly one hour sessions. 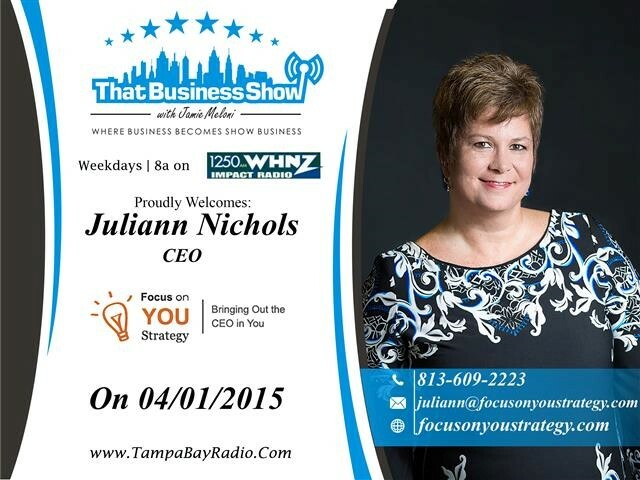 Learn more about Juliann Nichols and how she can help you succeed in business by visiting her website at http://www.focusonyoustrategy.com or contact her directly at 813-609-2223 or email at Juliann@focusonyoustrategy.com! On the 2nd half of the show, I welcomed Karen Gillman in studio. 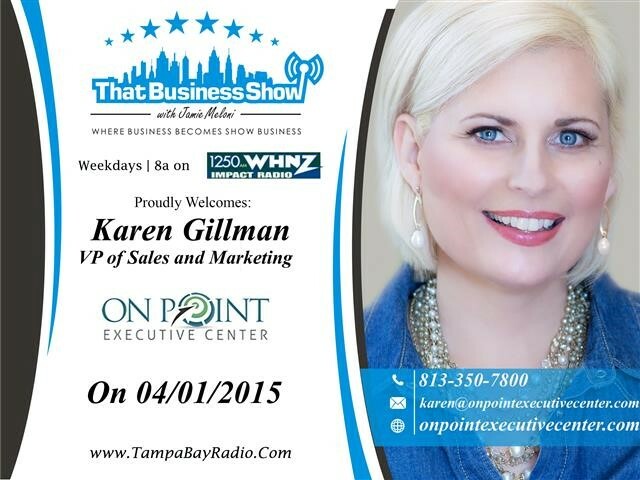 Karen is the sales and marketing director for On Point Executive Center located at 3030 N. Rocky Point Dr W Tampa, FL 33607. Their services cater to the small business by offering an office away from traditional office spaces. They have many services and amenities geared towards helping you run your business successfully and offer a range of products from conference rooms and mail services to social media assistance and smart boards. Karen also tells us her personal story of weight loss through which she lost 145 pounds and published a book on her experience called It’s Never Too Late which is available on CreateSpace and Amazon. Be sure to help support Karen and her business by visiting http://www.onpointexecutivecenter.com and by reading her book. You can also reach Karen directly at 813-350-7800 or email at Karen@onpointexecutivecenter.com for more information.